Today, we’re featuring an everyday classic “Soupe du Jour” — potage de légumes (vegetable soup). It is a low calorie meal starter abundant in nutrition and taste. Your family may be asking for another serving. While taking seconds is generally not a good idea, this shouldn’t really be an issue with the healthy potage de légumes. So enjoy! 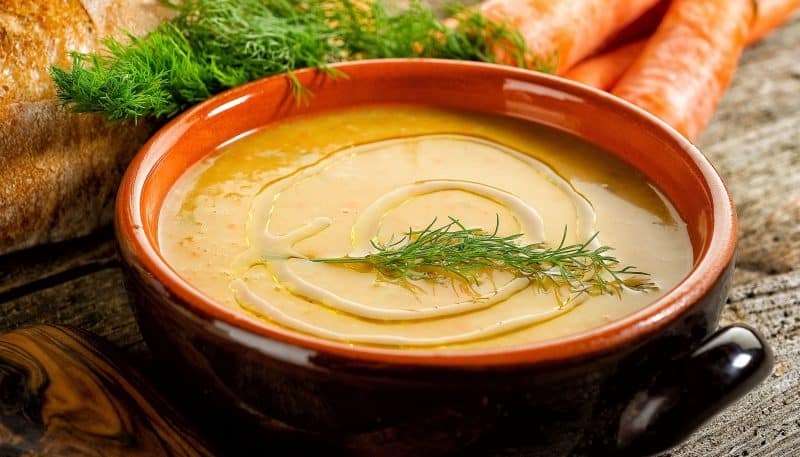 In France, a potage de légumes is typically served on winter weekday dinners before a light main course. However, you can also serve this vegetable soup in the early spring when we may be looking to lose a few pounds. Having a soup before your main course is a big help in ensuring we don’t overeat. And this soup is loaded with vegetables so it is also very good for your skin. A potage de légumes is very easy to make and so convenient, it can be made ahead of time. Check our detailed recipe and Art of the Home suggestions below. Enjoy and bon appétit! Peel and wash potatoes and carrots. Cut in small chunks (1-2 inches). Wash leek. First remove the end, and cut in half lengthwise. Separate leek leaves and wash in water. Dry, bundle together and cut in 1-2 inch strips. Peel onion and cut in small chunks. Place vegetables in a large pot. Pour in chicken broth and add enough water to cover the vegetables (about 1 liters/4 cups) — you will have about 8 cups (2 liters) of liquid. Bring to a boil and lower heat. Simmer 3/4 covered for 30 to 45 minutes (your veggies, especially the carrots, should be tender and soft). Puree your soup using an immersion blender until smooth. Variations: add 1 tsp of butter and mix in. You can also sprinkle grated Parmesan — very delicious. Texture: if you like a thicker soup, you can add one potatoe or reduce the water quantity.